Dailuaine 17 S.V. 1997 is a Single Cask vintage 1997 of Signatory Vintage which has been specially selected and is an exclusive, limited edition of 278 bottles for Le Comptoir Irlandais. Dailuaine 17 year-old S.V. 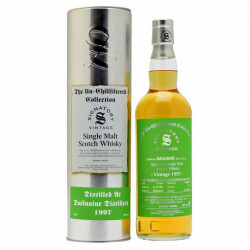 1997 is a Single Cask vintage 1997 of Signatory Vintage which has been specially selected and is an exclusive, limited edition of 278 bottles for Le Comptoir Irlandais. It is non-chill filtered to preserve its natural color and all of its aromatic bouquet. Dailuaine translates as meaning "green valley" in Gaelic. The distillery is located near the village of Carron, in Speyside, Scotland. Signature Vintage was founded in 1988 and is known by malt connoisseurs. The Symington brothers created the company and are specialized into vintages. Every bottle is numbered and hand signed.